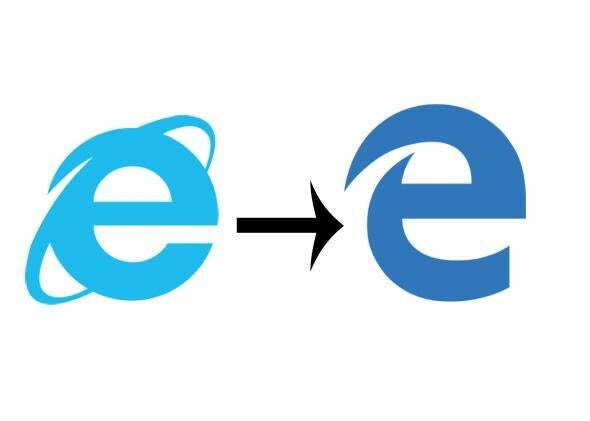 Microsoft's new browser Edge has a similar logo to Internet Explorer. Well that is … basically the same. We knew that the Internet Explorer era was coming to a close, but up until now Microsoft had only referred to its replacement browser as “Project Spartan.” Wednesday, though, during the company’s Build conference, Microsoft finally shared the real name: Edge. Microsoft Edge will be the default browser in Windows 10, complete with built-in Cortana functionality, note-taking and reader features, and a new way to render pages called EdgeHTML. It’s all radically new and exciting. Except Microsoft still just couldn’t bear to let Internet Explorer go. Instead of throwing its weight behind a bold, new product, the company made Edge’s logo a conspicuous nod to the IE logo. A promotional video (below) for the new browser boasts that, “It’s time to open that window and blur the edge between consumption and creation,” which is apt, because the other thing that’s blurry is Microsoft’s vision for this product. The company said in March that it was doing extensive market research into what the name and brand of the new browser should be. Looking back it seems like Microsoft could have probably just saved that time and money. It took a lot of work to rein IE in, but we already know that Microsoft has separation anxiety when it comes to killing its old products. So after all that, here’s Edge: the Internet Explorer you didn’t know you missed.